According to the 2012 Project of the Rutgers University Center for American Women and Politics, more women are running for Congress this year than ever. But how can we make an intelligent choice as to the best candidate when overwhelming research shows the decision is being made for us via skewed, imbalanced media coverage that has a predisposition toward taking men seriously and treating women like novelties? Research on media behavior in the 2010 midterms revealed women candidates got a whopping 68% less coverage than men on the issues and 3 times more attention paid to their appearance than their male counterparts. The Fourth Estate’s disturbing study found that men were quoted at ratios of five to one over women on women’s issues, and overwhelmed women’s opinions on the economy and foreign policy. No Republican woman is being seriously vetted for VP this year. Despite Mrs. Romney’s recent inference to the contrary, it is likely Mitt Romney will go with a “safe” choice. Conservative Pat Buchanan was just on a panel with the McLaughlin Group arguing that a female president would not be elected for another 40 years. Annoying as he is, he may be right. Why? Well, if past is prologue, let’s look at recent high level races. A blockbuster study conducted by George Washington University revealed Sarah Palin received twice the scrutiny as Joe Biden in their race for the Vice Presidency in 2008. We obsessed about Palin’s appearance, stand on social issues and family while Joe Biden got coverage on his stances on foreign policy and the economy. Furthermore, twice as many articles were published that obsessed over her every move whereas he got a relatively quiet ride. Mr. Biden is known for his “rhetorical flourishes” as President Obama calls them – otherwise known as gaffes. I like Vice President Biden, but no one could argue that he has a very long “blooper reel” to his credit. We just laugh it off – but if a woman said those things…. If you are talking about a woman like a homemaker, a mom (good or bad), and fashion plate, how likely are we to take her seriously as a leader? There is currently a big stink since Rep. Joe Walsh, who is running against war veteran and double amputee Tammy Duckworth made the comment that she is not a “true hero,” and that she talks about her service “too much.” So first we are dealt with as emotional beings, and then when we participate and sacrifice in what has traditionally been a male province, we are talking about it too much and not entitled to be taken seriously? Have I got that right? 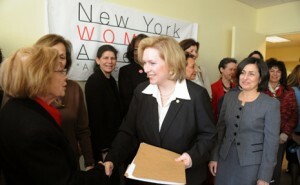 Linking the studies together that show a lopsided reliance on male reporters and male opinion, and the diminishing of women by turning them into objects to be used or manipulated, it is clear that we have many hurdles to overcome if women are to be given fair hearing when they seek legislative and leadership positions. Reading much of the commentary that still dominates cable shows and print articles, it is as if men who hold on to traditional power structures (and complicit women who likewise do not want to lose the illusion of male-provided security) are digging their in their heels, stubbornly hanging on to tired, yet comforting stereotypes that maintain the status quo and stifle competition from the encroaching female. In today’s complex and troubled world, we need the best leadership, ideas and representation possible. Hormones and X or Y chromosomes have nothing to do with it. Bias isn’t going to stop until we stand up and insist it stop. Anita Finlay is the author of Dirty Words on Clean Skin: Sexism and Sabotage, a Hillary Supporter’s Rude Awakening, available on Amazon in print and kindle editions. Why doesn’t the Arkansas Democratic party demographic representation goals require 52% women? Does the Democratic party require these demographic representation goals in all states? Waiting for parity feels like Waiting for Godot! We are more than one half the population yet have one sixth representation in Congress. But to do what you ask would be considered “unreasonable” by the powers that be. Hillary is the only woman ready to be president from day 1, not only that but the best president this country could have.She has a superior intelligence, ultra smart, down to earth, personable and an extraordinary human being.HILLARY 2012! no other woman can fill her shoes! I have written Hillary’s name on the ballot for President this year in both the primary and I intend to also do for the general election. I want the very best for my country. Well, Katia, you won’t get an argument from me on that score. Just from my research of the book, people I spoke to who have worked with her and sat in a room with her with blown away by her depth and knowledge on the issues, as well as her probing nature. I also interviewed people who had been personally helped by her when she was First Lady and Senator, so we would be mighty lucky to have her as our President. Thank you for your comment. Right-minded saying thanks will not reasonable be sufficiently, for the wonderful pellucidity in your writing. Advantageously, the advise is in fact the sweetest on this creditable topic. I actually have your Darkish Traditional High to get deliver the results. That i disk drive a faculty Bus. gucci ladies watch stainless steel your toes way however , for no reason overly way, Really wonderful. I purchased this breadmaker memorable Schokohrrutige big to get heading out!!! !